Statistics are often revealing, but the human aspect in the final event of the 2018 NASCAR Pinty's Series Driver Championship battle will be the deciding factor in Saturday night's race at Jukasa Motor Speedway one kilometre (0,625-mile) paved oval located near Hamilton Ontario. The race bears the appropriate name: The Pinty's Fall Brawl. In an article written this week by Bryce Tumer from CANrace, Tumer shows how the two leading contenders for the NASCAR Pinty's crown are on equal footing statistically after 12 of 13 races, with Alex Tagliani trailing points leader LP Dumoulin by a mere, but so very important four points. Part of the difference: the three wins to two margin in favour of Dumoulin over Tagliani. Statistically speaking, they each have seven podiums and eight top-five finishes. We discard their top-ten finishes because the finale will be played on a higher level as there are only 15 drivers entered so far in the final race of the 2018 season, which is scheduled to start at 7:35 p.m. this Saturday. The winner will earn 48 points. The others, from second place down, earn 42 points, 41, 40 and so on down to the last starter. "This is an exciting weekend coming up and I am so ready for this decisive race," said a confident Alex Tagliani. ¨We have to keep doing what we have done best all year long: Getting our car ready in practice to make sure we have a bullet for qualifying. We need to put the Chevrolet Camaro EpiPen/RONA/St Hubert on pole and run up front to score an important extra point for leading the race. Our race strategy has to be perfect as there will be some live pit stops. Our boys in the pits are top of the line and are very motivated and focused. This is a very important race and Team 22 Racing will put everything on the line for this one because they want and deserve to win the championship as much as I do. Can't wait!" Tough to say which of the two leading contenders will have the upper hand at Jukasa. Neither driver has won nor led a race lap in the two previous races on this oval track. In 2017, Dumoulin qualified 20th and finished third while Tagliani started fifth and came home in sixth place. Earlier this year in June in round two of the 2018 schedule, Dumoulin started ninth and crossed the finish line in seventh place. Tagliani gained three positions from his starting point to finish third. Slim one point edge (79-78) in favour of Tag over Dumoulin after the two events. The pressure is unlikely to be as intense on point's leader Dumoulin, who must however finish within four positions behind Tag in the race to win the title. But Tag can seal the deal by winning the Fall Brawl. Caution and patience could be Dumoulin's mantra in this 200-lap affair. As for Tag, he must continue to do what he has done best in the last three races and charge hard to the front and finish ahead of Dumoulin. 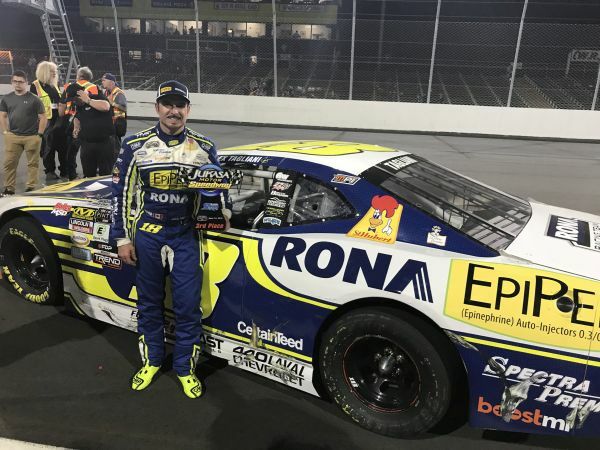 Can Tagliani count on getting some help from Racing 22 teammates Marc-Antoine Camirand and Donald Theetge to win this coveted title? We should have an answer to that question late Saturday night. The only runner-up driver ever to win the NASCAR Pinty's title entering the season finale, was Racing 22 principal Scott Steckly in 2013. Five points separated him from DJ Kennington, but Steckly won the championship by two.